Boys and girls today we are going to learn what a shepherd does all day long in the fields as he watches his flock. We are going to travel along with a shepherd and see how he cares and protects his flock. Let's go just over this hill and here we will meet our shepherd who is going to guide us while he cares for his flock. Oh! Look, there he is now just over the hill. The grass is really green and soft. There are flowers all over the field. There are the sheep. They seem to just walk and eat. Surely a shepherd's job can't be all that hard to do. Let's go talk with our shepherd and see what he has to say. "Hey, we are here to follow you and watch you care for your flock. They seem to be just walking here and eating grass." "Yes for now that is what they are doing," the shepherd says as he keeps a watchful eye on his flock. "Do you bring them to the same place everyday or go to different places?" "I have several places that I take them. In the morning, I take them up where the sun is shining and there is plenty of room for the young ones to play… Here we stay until around lunch time and then we go down in the valley where they can get a drink of water and rest for a while." "What do you do all day while the flock is eating and playing? Don't you get bored with nothing to do but watch your flock?" I asked. "There is plenty to do. There are wild animals that try to catch the sheep and kill them for food. I have to be constantly watching out for them. Sheep are not very smart when it comes to danger. They depend on me for their safety and protection. Sometimes I even have to fight bears and lions to protect my herd." "That sounds dangerous. I don't know that I would want to fight a bear or lion. How about you boys and girls? That sounds a bit too dangerous doesn't it?" "It can be very dangerous, but I have learned how to fight them and I have not been hurt too bad." "That is good, although you could be hurt very badly if one of them caught you not watching." "Yes, that is right. That is why this is not a boring job. I really have to keep a close watch for these animals. I would not want the sheep to be hurt or killed." "Boys and girls, do you have a question for our shepherd? Yes you would like to know if any of the sheep get sick." "Sometimes they do," says the shepherd. "We have to see that they get good grass and don't get into any watering places that have bad water or eat any poisonous plants. This is why I only take them to the places that I do. I know these places and know that there isn't anything that would hurt them or make them sick." "This little girl asks if any of the sheep run away or get lost?" "Good question. Let's go and count the sheep now. I have to count them several times a day to see that they are all still here. If they are not, I have to go and look for the one that is lost. Can you help me count them?" "Let's help him count his sheep, boys and girls. This is hard to do. They don't stand still and when they move we loose count." "Yes, it is hard. Let's see. I've only counted 99 sheep. I have 100 sheep. Let me count them again to be sure. 98, 99. Oh, No! We only have 99 sheep. I must go and look for my lost sheep. I think it is one of the little lambs. They get busy playing and go too far and get lost. Will you help me?" "Come on, boys and girls; let's help him find the little lost lamb. Will the rest of them stay here and eat?" "Yes they will. Come, we must find our lamb before it has wandered too far." "I hear it. It is over here down this cliff. I must get it before it falls off the cliff." "Let me get it. It knows me and will come to me. Thanks anyway." "Boys and girls this looks very dangerous. I hope he can get that little lamb and not get hurt himself." "Here he is. Not even a scratch on his body. I am glad he had not gone too far off the cliff. It could have been very bad for him. Thanks for your help." "You're welcome. We didn't do very much. I am glad that you got him and neither of you got hurt. We must go for now. Thanks for helping us understand just what your job is all about. Good Bye and Good Luck." Boys and girls this reminds me of a story in the Bible where the shepherd lost his sheep and went after the one that was lost. He too left all the rest of the sheep and went in search of his lost sheep. He found his sheep and brought it back to safety with all the other sheep. Jesus does the same thing for us. Sometimes when we feel so all alone and feel that nobody cares about us, Jesus comes and wraps his loving arms around us and takes us back to a safe place where he takes care of us and fills our hearts with joy and happiness again. Jesus does not want to loose a single one of his children. He will go to the very ends of the earth to find us and bring us back to him. Jesus is our shepherd and will always be watching over us and taking care of us. He will care for us, just as the shepherd fights the lions and bears to protect his sheep. Nothing can ever hurt us when we have Jesus in our hearts. My hope is that each of you has Jesus in your heart and that you spend time each day reading your Bible and talking to Jesus. He loves to hear from you and lead you through your life. He wants to hear every detail of your life and know every thought in your heart. How does Jesus Know Where You Are? A question that you may be thinking about is how does Jesus know where all of us are all the time? Jesus is God's son and he loves us and does know where each of us are and what is going on in our lives at any given moment. His promise is that he will be with us even to the ends of the earth. If He already knows, why do I have to tell Him? Another question you may have is if Jesus knows what is on our hearts and knows all about us, then why do we have to tell him? Jesus wants us to spend time with him just like your own father does. Imagine how your earthly father would feel if you never told him anything about your day or even told him that you loved him. He would feel very left out and feel that you did not love him. This is how Jesus feels when we don't talk to him. He is our heavenly father and loves us and wants us to love him and tell him that we love him. When we spend time with him, we will be building a strong relationship with him and we will grow to trust him more every day and he will show us more every day. Jesus loves us more than even your earthly father can love you. Jesus' love is a perfect love. It has no boundaries or rules. He loves us totally and completely. A Bible verse that may help you understand this better is found in 1John 4:19 KJV. It says; we love him, because he first loved us. This tells us that Jesus loved us first and that we love him because he loved us first. He loved you before you were ever born. Another verse that may help you to understand is found in Proverbs 8:21 KJV. It says; that I may cause those that love me to inherit substance, and I will fill their treasures. This means that if we show our love for Jesus by praying to him and telling him that we love him and doing good things, he will gives us a very good life and will continually bless us and care for us. Dear Jesus, we thank you so much for your love and protection. Thank you for our families and the beautiful world that you gave us. Please help me to always spend time with you and to always do good things in my life. Jesus I love you and want you close in my heart. 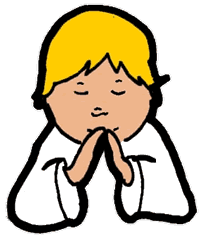 In your name I pray. Amen. Boys and girls I hope you have enjoyed our trip and that you have learned of the great love that Jesus has for each of you. I look forward to our next time together. God bless you and keep you. I too was wanting to know the artist of the above illustration. After some research I found it to be Alfred Soord (1868-1915) and the painting is titled The Lost Sheep. Hope this helps! Is this story one of a series written for children? It was so clearly written, that i loved reading it and would only hope that adult sermons were so gently and with words that don't confuse. these are the best stories,i dont want to stop reading them,there are the best,i like them very much. My wife was wondering who the illustrator of the image at the top of this page is. 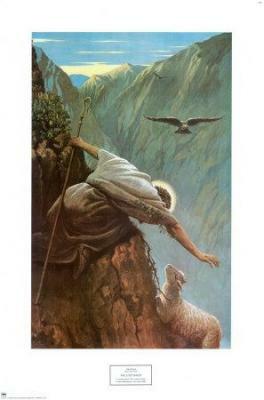 The one of the Shepherd reaching for the sheep.